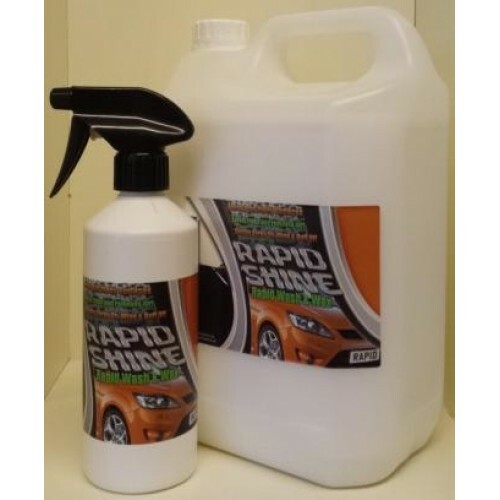 Rapid Shine Waterless Car Wash and Wax is a revolutionary new way to clean, polish and protect any vehicle without using water. Years of development and research have resulted in a Waterless Car Wash and Wax that is so easy to apply and the long lasting results are amazing. Our Waterless Wash & Wax can be used on your entire vehicle including paintwork, wheels, windows, interior plastics. It is the perfect all round vehicle cleaner and better for the environment. 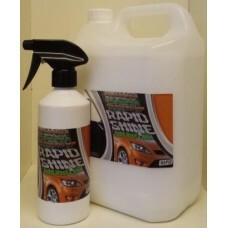 Rapid Shine Waterless Car Wash is a revolutionary new way to clean, polish and protect your vehicle. Waterless wash and wax is a technique developed to wash and wax a vehicle without the use of any water. This technique uses many different ingredients, including wetting agents, lubricants and protectants. The detergents and wetting agents combine to soften and emulsify surface grime, while lubricants attach a microscopic layer of protectant to the surface. Our Waterless Wash and Wax lifts dirt from the vehicle by emulsification. This is done by products surrounding dirt molecules, lifting them from the paint surface, all this before you start to wipe. At the same time, the application process initiates the cross chain polymer linking process that results in an extremely shiny showroom finish, which also offers a highly protective glaze finish. All this happens very rapidly due to the balance of ingredients within the product itself. Application is quick and easy and the process does not involve high pressure or any extensive rubbing. The application also does not require "soaking" - or using high volume of the product. Please used in compliance with the "directions for use," copies available on request, your vehicle will have a ‘showroom like’ shine that is only usually achieved with expensive waxes. Unlike many other Waterless Wash and Wax products on the market ours does not contain silicone. In the wetting agents, lubricants and protectants lye’s a high concentrate of Carnauba and other high quality wax’s. The amazing formula is guaranteed to challenge any leading brand, scratch resistant and amazing value for money. - Revolutionary new way to Wash, Wax and protect your vehicle. - Just 1L can wash, Wax and protect your vehicle up to 14 times. - 1L can save up to 2000 Litres of water. - Forget sponges, buckets, chemicals, hoses this dose it all. - Quick, easy, safe and effective. - Much better for the environment. - Wash and Wax your vehicle anywhere; Outside and also inside.